San Diego Solar Power Installation - San Diego Roofing Inc.
San Diego enjoys over 263 days of sunshine every year, making it one of the perfect locations to install solar panels and harness the 100% clean, renewable energy of the sun. You could save as much as 50% or more on your energy bill each month with a PV (photovoltaic) system! That means your new solar power system will be paying for itself from the moment our solar panel installers turn your system on. 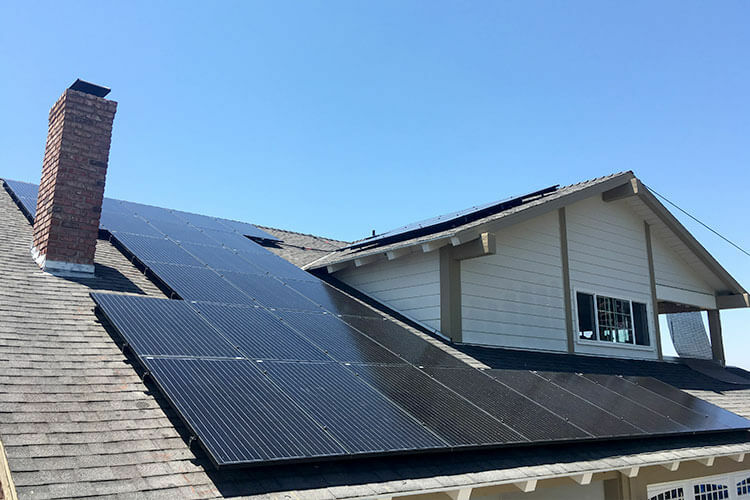 At San Diego Roofing, our solar panel installation team have years of experience installing solar panels on all types of roofs on homes and businesses throughout San Diego county. Request an estimate today to see if solar power is a great fit for your San Diego home or business! Solar power is a smart, long-term investment for any home or business. In addition to being great for the environment (solar power has 0 carbon emissions), sunshine is free and readily available in southern California – where we have some of the highest utilities rates in the country (second only to Hawaii). Solar panels can reduce (or even eliminate) your electricity bill, reduce load on the electrical grid, improve the resale value of your home, and even help you receive Federal and State incentives for installing solar power for your home or business. Solar power systems are designed to be extremely durable. Lasting 25 years or longer, they withstand the test of time and also extend the useful life of your roof (ask us how)! San Diego is one of the best locations in the country to install solar panels, and with the “Net Metering” program in California, you can utilize excess energy generated during the daytime to pay for your electrical usage at night. 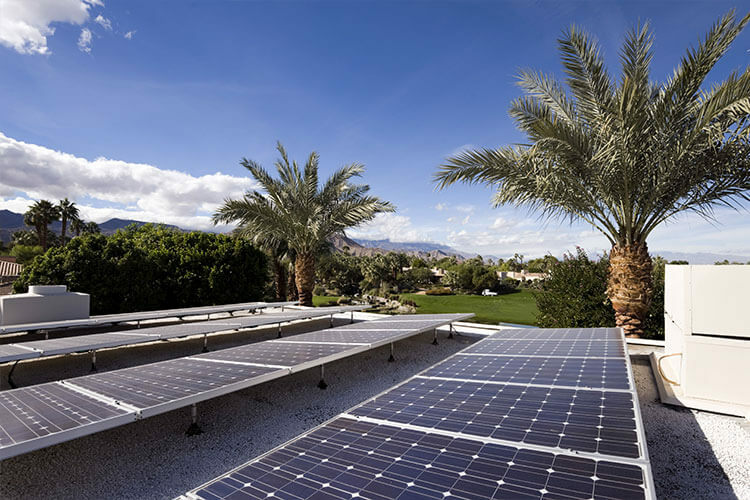 The photovoltaic systems we install at San Diego Roofing are some of the best solar panels in the industy, and are highly efficient at generating solar power. These high quality solar systems will outlast other brands and generate amazing returns for you or your business. Why Choose A Roofing Company for Solar Installation? When considering solar power for your home or business, the condition of your existing roof is always a factor. Installing solar panels on an aging roof doesn’t make sense. For companies that only do solar power (not roofing) it is common for them to only repair or replace the section of the roof where the solar system will be installed. This doesn’t make sense – not only will your roof not be the same age, it will also leave gaps in (or void) your roof warranties. At San Diego Roofing, we have been serving the San Diego community for over 80 years and look forward to 80 more. Our specialty is roofing, so we get the job right the first time around, and that includes making sure your roof is ready for solar. We will evaluate your roof and make recommendations for both solar AND your roofing. We are your lifetime company for your lifetime investment. Did we mention there are many great options available to buy your new system? 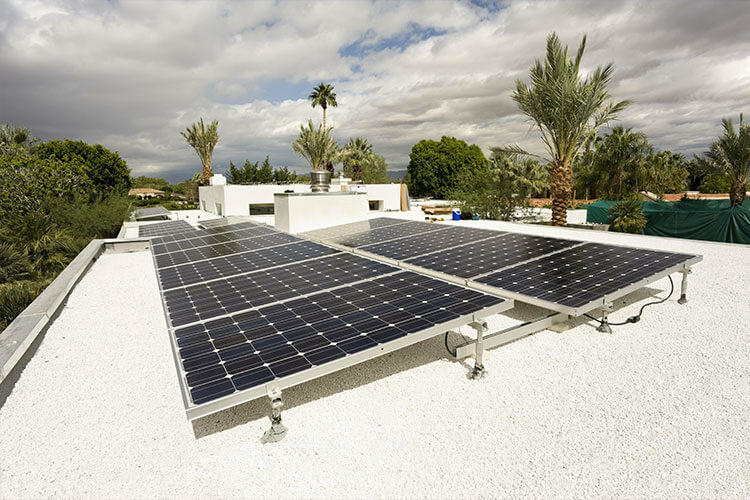 If you are looking at installing solar panels for your San Diego home or business, we will help you find the right path to buying your new solar power system. Whether it’s buying your system outright, financing it, or simply leasing your system – our knowledgeable team members will help you make an informed decision that is the best fit for your needs. Purchase your own system with no money down! Ask your solar expert about our promotions! Leasing is always a great option, and doesn’t include your debt-to-income ratio in the approval process! We have multiple financing partners available (Hero, Ygrene, PPA, or any other financing) to help you pay for your new solar system! Our customers generally save upwards of 50% on their utility bill. Total savings depends on your average utility bill, size of your solar system, and direction/placement of your solar panels. Do I ever pay anything? At San Diego Roofing, we can install the solar panels at little to no upfront cost. There are several options tailored to suit different needs to purchase power, lease a system, or buy a system. We work with homeowners and businesses to find the perfect solar solution for their needs. What happens if I sell my home/business? The title of the system will be transferred to the new owner. It cannot be taken down and reinstalled at a new residence, it comes with the home just like a kitchen or bathroom does. Who is responsible for maintaining my roof and system? The licensed install company is legally required to fix any install-related roof damage for ten years. They are also contracted by the state and panel manufacturer to maintain system repairs for ten years, unless the system was purchased and is owned by the customer, in which case the customer is responsible for maintaining the system. When the sun shines, solar panels collect energy from the sun. The panels take the sun’s energy, and convert it into usable electricity. The usable electricity flows from the panels, through the new meter, and into a home. What determines whether my home/business is a good candidate for solar? A member of the San Diego Roofing team will conduct an on-site survey to determine if your home or business is compatible. Here are some examples of what we look at to confirm solar is a good fit: roof size, angle and direction; shading of the roof by trees, other homes, etc. ; roof stability; existing electrical wiring, and current electrical consumption. Why Choose San Diego Roofing? Our San Diego solar panel installation crews have performed thousands of installations across San Diego county and southern California. Our company has been in business for over 80 years, and we only use the highest quality brands and materials that we know will outperform and outlast anything else on the market. 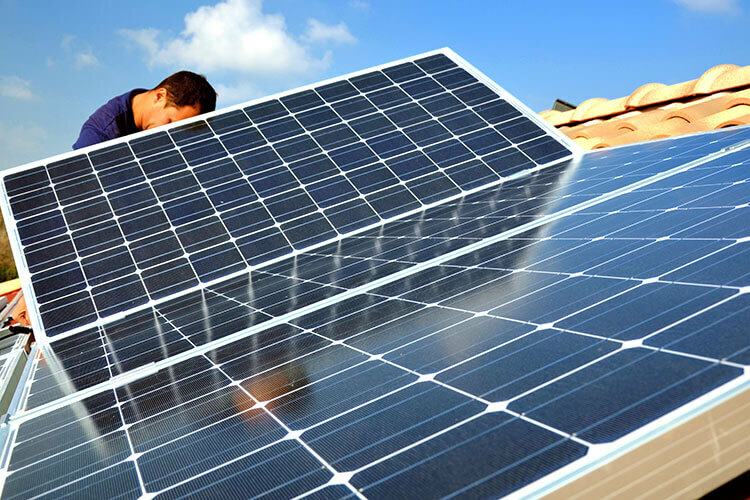 We invite you to request a free quote for solar panel installation at your home or business. A member of our expert team will be in touch to get more information and discuss your solar power options.